The sternal angle also referred to as the angle of Louis, is created by the combination of the manubrium with the body of the sternum and it can be identified by the existence of a transverse rim on the anterior side of the sternum. Surgically, anatomically and medically, it is a vital anatomical landmark. Manubrium crosses the body of the sternum around 4 cm inferior towards the jugular notch, at the manubriosternal joint. The sternal angle marks out the inferior border of the superior mediastinum and is located at the level of the intervertebral disc between T4 – T5. 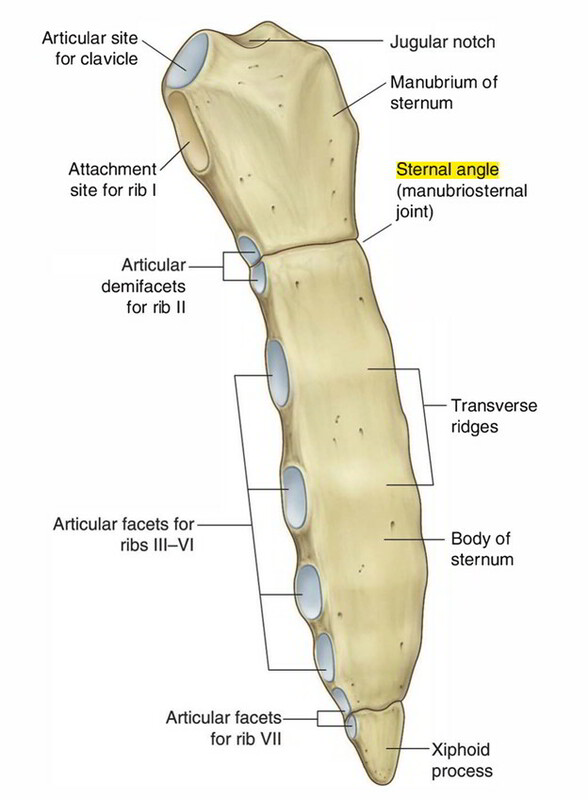 The 2nd rib combines with the sternum at the sternal angle, and makes it an important site for determining rib number. Origination and termination of the aortic arch. Division of the pulmonary trunk, branches of pulmonary trunk. Under arch of aorta – Left recurrent laryngeal loops. Ligamentum arteriosum is located at this level. Azygos vein drains into superior vena cava. Thoracic duct drains within left subclavian vein.